Well, it finally happened – one of the things Kimm and I most dreaded! Our landlady and her intern went to Taos this morning, but she needed hay and it was left to us to take the OLD AND RICKETY(!) hay truck into town to get it. This truck A/K/A “Big Red”, is well known for her temperamentality and emotional issues, and Kimm and I were very nervous about driving her almost 30 miles on the highway. We got to town – Las Vegas, NM – in one piece, and had a couple of stops to make before going to the hay barn. I have to say here, that Kimm and I mostly laughed all the way to Vegas. We kept looking at each other as if to say, “WTF?? ?” – we were finding this entire new adventure both amusing and terrifying. Kimm maneuvered Big Red like a pro through Walgreens parking lot, and the discount market’s parking lot. 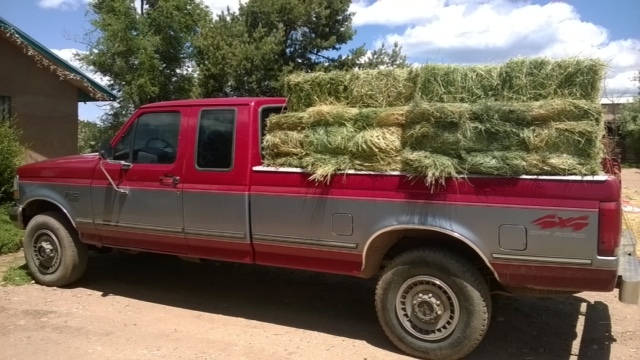 When we were finished at the market, Kimm turned the truck around and began to head for home, totally forgetting that we had to get hay! I laughingly reminded her that we were on a mission here, and had not come to town to go to the pharmacy and the market. We arrived at the hay barn thinking our landlady had called ahead. Well she had called the fork-lifter, but not the cashier. So, into the barn we drove and I am here to tell you that 2 tons of hay were put on the back of Big Red! At least, that’s what it felt like. The rear window was completely blacked out. Junior, the fork-lifter, was very amused by us city girls, and also quite sweet. He tied everything up, Kimm paid with our landlady’s check, and we were finally home bound. With a 30-pack of beer in tow!!! I can say that the ride was basically uneventful, although I wouldn’t be a bit surprised if Kimmie needed some doTerra Essential Oils rubbed on her shoulders before she goes to bed. We were both a bit tense. Chloe greeted us like returning warriors – which we were!- and we opened beers right away even though it wasn’t even noon. Oh! And I forgot to mention that our landlady also asked us to give a little lunch to the mares and babies – of which there are many at the moment – but we each drank a beer before setting out. And yes…the beer helped! Being from Philadelphia and NYC, Kimm and I have come a long way from Urbania! We have learned how to feed and interact with 30 horses, clean poop and birth foals, and the entire experience has been a joy! And now we know how to drive Big Red and get hay – just another thing our delightful landlady can ask us to do! When we stop to think about it, Kimm and I both find this transformation from city to country really astounding. It has also been a time of reflection, re-assessment, and new found Peace. We love where we are now, physically, emotionally, spiritually, ad psychically. We couldn’t be any place better than here in rural New Mexico. And yes…beer helps! Next Post doTerra With the iWonder SIsters This Week For Some Great Rewards and Freebies! Yes! !